The Four Poster Classic Bed by Get Laid Beds is the king of beds with its prestigious appearance, size and the instant luxury factor. The Four Poster Bed dates back to the Tudor area but this bed has been updated to a more modern specification for maximum appeal through the use of a simple design with clean lines to ensure an excellent statement piece to any modern or traditional home. The Four Poster Bed Classic has been designed to bring grandeur and that ‘wow’ factor to any bedroom and features an incredible height of 2 metres and looks particularly impressive in oak. 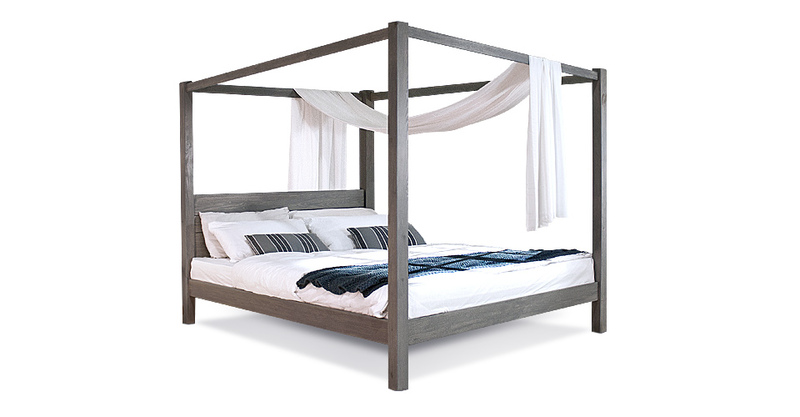 The Four Poster Bed by Get Laid Beds is available as standard using the solid Scandinavian pine option but should you prefer an even more luxurious bed frame there are hardwood options available such as ash which is known for it’s durability and the classic oak, which dates back for use within furniture for centuries. With our solid Scandinavian pine option, there are a wide variety of stain options to choose from to ensure that there will be something suitable for you and your décor. The bed is manufactured using traditional mortise and tenon joints which simply slot into place and then are secured by screws – this ensures that there are no complicated procedures for the customer to go through though the order will come with full instructions and help will always only be a phone call away. As all of the beds are handmade to order, there is a customisation and bespoke service available to tailor make your bed for your own individual needs, so should you love the Four Poster Bed design but not have the required height in your room – no problem, just let us know and for a small additional fee we can have that altered for you. Please quote this Products's code 10003B to speed up your query if related. by Get Laid Beds is the king of beds with its prestigious appearance, size and the instant luxury factor. The Four Poster Bed dates back to the Tudor area but this bed has been updated to a more modern specification for maximum appeal through the use of a simple design with clean lines to ensure an excellent statement piece to any modern or traditional home. The Four Poster Bed Classic has been designed to bring grandeur and that ‘wow’ factor to any bedroom and features an incredible height of 2 metres and looks particularly impressive in oak.